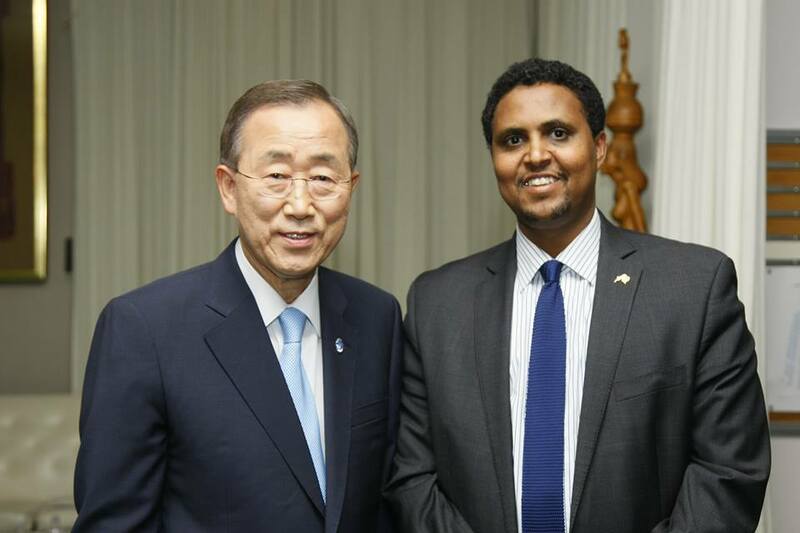 Above, Idd Mohamed posting with UN General Secretary Ban K-Moon. Idd Mohamed immigrated to Canada in 1990, eager to get an education before moving back to Somalia and saving his homeland from murder and mayhem. Mohamed obtained a master’s in political economy and has enjoyed a front seat to Somalia politics ever since. Mohamed was one of the organizers of a 2000 conference in Arta, Djibouti, where Somali seculars, religious and clan leaders got together and tried to end warlordism and lawlessness by forming a government. He went on to join the Somalia mission at the UN. In this role, he became an influential person in Somalia’s interaction with rest of the world. I caught up with Mohamed recently while he was visiting extended family in Eagan. Mohamed is finalizing a short-term plan to start a financial services business in the Middle East. In the long run, he wishes to establish a stock market for Somalia. Mohamed told me the stock market idea is more of a dream than a realistic plan. It's an entertainment of sorts, because Mohamed doesn't think Somalia will change sufficiently in the near future to make a stock market possible. "Maybe in the year 2030 Somalia will be ready for it,” he said. With this realization, Mohamed has some advice for Somalis in Minnesota: He said going back to Somalia and forgoing opportunity in America would be "foolish." He had particularly harsh words for leaders in Somalia who often encourage the return of skilled Somalis. Mohamed described Somalia leaders as "opportunists, shortsighted and self-centered.” Skilled Somalis have better opportunities to improve themselves and their community in Minnesota, he said. In order to drive home this point, Mohamed contrasted Minneapolis Council Member Abdi Warsame with Guled Kassim. Warsame, Mohamed said, focused on redistricting in Minneapolis ensuring Somali residents were concentrated in a ward he could win. Mohamed believes Somalis in Minnesota who are interested in the electrical process have similar opportunities. Kassim, on the other hand, continues to have one leg in America and another in Somalia. Kassim unsuccessfully ran for a state house seat in Maryland but went back to Somalia where he currently serves as a minister for a government which only exists in name. Mohamed attributed Ahmed's loss to his divided attentions. Voters in Maryland were parhaps suspicious of his contined political activities in Somalia. Mohamed predicts Kassim will return to America and start life again as newcomer. Warsame's electoral success, Kassim’s vacillation and the unabating political violence in Somalia since 1990 leave Mohamed wishing he could do things over again. No doubt these are powerful observations and illustrative lessons for Somalis in Minnesota.